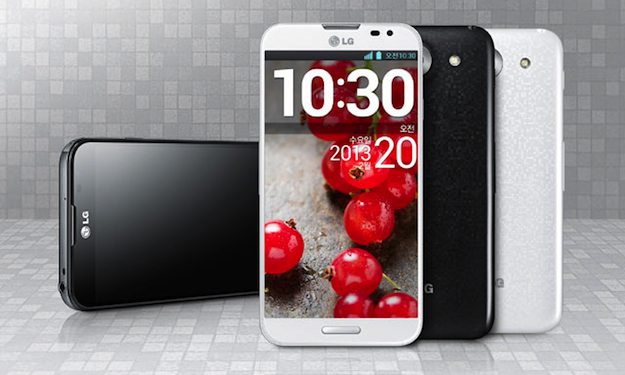 Check out our full review of the LG Optimus G Pro cell phone. LG has been steadily leaking details about the new hardware it intends to release at Mobile World Congress at the end of the month. We’ve seen brightly-colored packages, less-than-subtle hints at how many new products we can expect, and a video teaser trailer too. Despite all this build-up, the company has officially announced a few of the phones we were expecting to arrive at the Barcelona show, such as the new Optimus L Series II handsets. Now it has given us the Optimus G Pro. Hold on, you may be thinking, that’s already been announced. Yes, indeed it has, but LG has announced a second model and just to confuse everyone, it hasn’t changed the name. The new Optimus G Pro is differentiated by a larger screen – just as the leaks predicted – which measures 5.5-inches and it has a 1080p resolution. According to the press release, LG has slimmed down the bezel on either side of the display in an attempt to keep the handset as compact as possible, however it hasn’t provided any dimensions with which we can compare it to the 5-inch Optimus G Pro or its primary challenger, the Samsung Galaxy Note 2. LG has also kept quiet on the new model’s overall specification, although it’s believed not to have altered in any other way over its smaller sister phone. If that’s the case, the big screen Optimus G Pro will be powered by a quad-core Snapdragon processor with a clock speed of 1.7GHz and 2GB of RAM, with a 13-megapixel camera on the rear and Google Android 4.1 Jelly Bean running the show. While the 5-inch Optimus G Pro is headed only for Japan at the moment, the 5.5-inch Optimus G Pro will be released at the end of February, however as the press release is in Korean we’re guessing it’ll only be out in Korea. That could all change at Mobile World Congress, as the 5.5-inch Optimus G Pro is rumored to be one of the four new devices launched there, along with either three new F Series phones or the already half-announced L Series II range.